Izaak Walton Campground: Find some exciting info about camping in your RV at Izaak Walton Campground near Sterling Alaska. We now include additional material for the Izaak Walton campground including info for RV camping, Izaak Walton campground features, fees and photos too. Moose River Campground with fishing access on both the Moose and Kenai Rivers. NOTE: Camping fees increased on January 1, 2015 from $10.00 to $15.00 per campsite. Fees for daily parking remains unchanged at $5.00 per vehicle. During the sockeye salmon fishing months of June and July, Izaak Walton Campground can get pretty busy. The boat launch is popular with locals and guides alike and the bank fishing is very popular too. As one of the more popular campgrounds for salmon fishing on the Kenai, Izaak Walton is still one of those destinations that offers an amazing family outing. 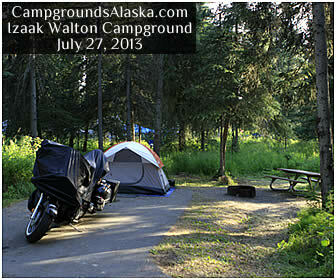 Description - Izaak Walton Campground offers 31 dry campsites on the shores of the Kenai River adjacent to its confluence with the Moose River. Every campsite offers a bit of seclusion with shrubbery separating the sites from each other. Picnic tables and fire rings are provided as are clean restrooms and conveniently located potable water. Directions - Following the Seward Highway south to the town of Sterling AK, the campground is located at milepost 81. Izaak Walton Campground is located in Sterling Alaska where the Moose River enters the Kenai River, this popular salmon fishing location is a popular destination for fishermen with great bank fishing from the campground. Max Length - Realistically, 32 feet but two sites can handle larger units. Additional Amenities - Walking distance to stores and services. Great fishing access for sockeye and silver salmon fishing in the summer and fall.